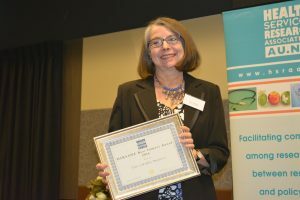 This year we introduced a number of new awards to recognise individuals and projects which have made significant contributions to the fields of health services research and health policy in Australia and New Zealand. This new award recognises health services research that has had a significant impact on health and health care. The award is intended to identify and promote examples of outstanding research that has been successfully translated into health policy, management, or clinical practice. The standard of the nominated projects was extremely high and the judges had a very difficult task picking a winner. 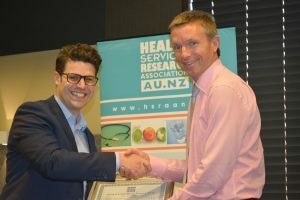 The nominated projects were presented at the HSRAANZ Symposium as examples of the real world impact on health services research. A/Prof Ian Scott and his team with their work - “Maximising value of healthcare”. •Improving access to emergency care within hospital practice – large scale tertiary hospital reform program which raised NEAT 4-hour compliance rates from 32% to 62% over 9 months (P < 0.001) in association with reduced in-hospital mortality (from 2.3% to 1.7%; P = 0.04). Many of these reforms have been implemented in other hospitals and have been presented to several health service conferences. • Lead clinician in collaboration producing systematic review of evidence for 4-hour rule targets indicating all targets were arbitrary. Subsequent investigation of datasets from 59 Australian hospitals which found that adjusted in-hospital mortality for emergency admissions falls as 4-hour NEAT compliance rates rise to a nadir of 83%, with no further increase thereafter. This was an international first in presenting an evidence-based target of around 80% which Queensland Health adopted, with other jurisdictions considering similar moves, and researchers in the UK and New Zealand aiming to replicate in their jurisdictions. • Design and implementation of an integrated end of life care (EoL) program which incorporates advanced care planning (ACP) for patients with limited prognosis and which involves all hospitals, RACFs and general practices in Metro South (MS) Hospital and Health Service (HHS). More than 2600 patients have completed ACP in the last 2 years, and our methodology has been adopted by another 12 HHS and several other primary health networks. This work has been recognised by Queensland Health Minister at recent COAG meeting. The Accelerated Chest Pain Risk Evaluation (ACRE) Project is a structured program of clinical redesign which has rapidly translated research into clinical practice. The project aimed to improve the assessment patients presenting to emergency departments (EDs) with chest pain and to evaluate the health service outcomes of the change in practice. The project was based on high-quality clinical evidence from locally-derived, widely cited research published in 2012 (The ADAPT trial). A pilot study at a single site in Queensland was undertaken in 2013 followed by state-wide implementation in all eligible hospitals over a 2-year period from 2014 to 2016. Pooled data from 12 months pre-implementation and up to 16 months post-implementation has demonstrated significantly decreased ED length of stay, hospital admission rates to inpatient units and total hospital length of stay. For all patients presenting with possible cardiac chest pain median total hospital LOS fell from 1210mins to 806mins (404mins 95% CI 370-437mins). Hospital admissions fell from 70.4% to 57.3% (-13.1% 95% CI 12.3 - 13.9%). From May 2014 to the end of April 2016 51,042 patients have presented to the ED’s across the 18 sites with possible cardiac chest pain. Of these, 12,138 (24%) have been managed on the ADAPT-ADP. This research has resulted in substantial released capacity with economic impact evaluation suggesting savings of more than $7.5 million per year across the state. Adj A/Prof Prof Terri Jackson for her project on – “Using information on hospital acquired diagnoses to improve hospital care"
• Studies to investigate methods of using data on multiple emergency department presentations to predict delayed or missed diagnoses, using linked data to identify readmissions attributable to a hospital-acquired diagnosis in a previous admission, and data mining techniques to measure the extent to which hospital-acquired diagnoses are associated with the patient’s reason for admission. Andrew Partington, is Principal Project Officer, Activity Modelling and Purchasing, System Performance and Service Delivery, SA Health. 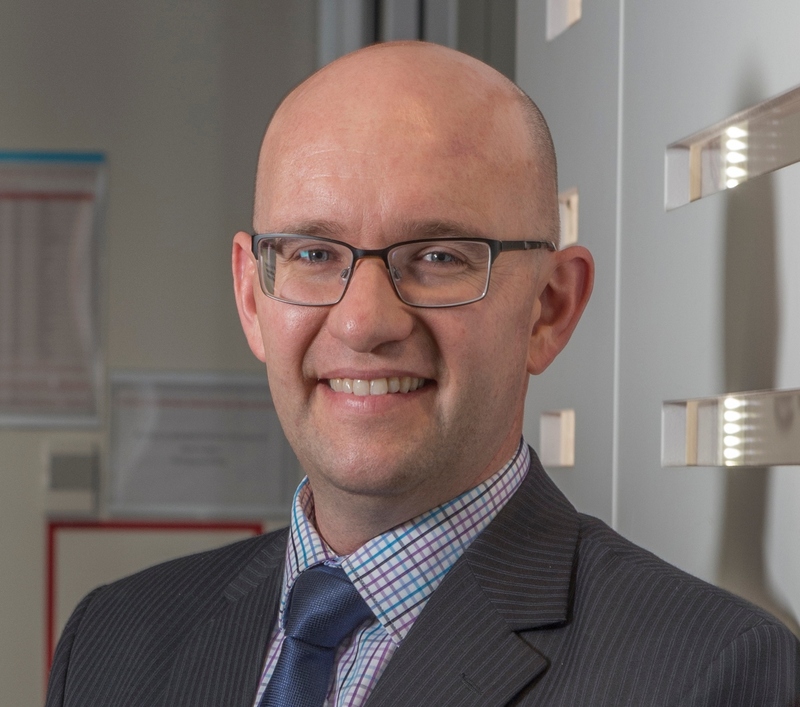 Having worked as a Research Associate within the Adelaide Health Economics Group at the University of Adelaide, Andrew has spent the last couple of years as a strategy consultant within the UK National Health Service. Most recently, he joined the South Australian Department for Health & Ageing where he helps to lead state-wide commissioning initiatives. While his research focus includes unwarranted variations and health state valuation, Andrew is most interested in improving the way health economics is used to engage diverse decision-makers in service quality and financial sustainability initiatives. The Best Qualitative Paper was awarded to Lindy Willmott and her collaborators for their paper “Reasons doctors provide futile treatment at the end of life: a qualitative study”. 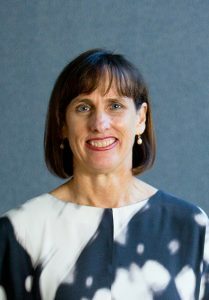 Lindy is a Professor with the Faculty of Law at the QUT and a Director of the Australian Centre for Health Law Research at QUT. She researches in the area of health law, particularly end-of-life issues and is currently undertaking a number of empirical research projects funded by the ARC. She is also a Chief Investigator in a NHMRC funded Centre of Research Excellence on End of Life. Lindy is also the author of many books across various fields of law and is one of the editors of the book ‘Health Law in Australia’. She is a former member of the Queensland Civil and Administrative Tribunal and the Queensland Law Reform Commission. 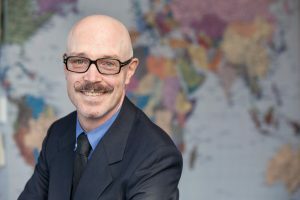 Professor Ben White is a Director of the Australian Centre for Health Law Research in the Faculty of Law at the Queensland University of Technology (QUT). Ben graduated with first class Honours and a University Medal in Law from QUT and then completed a DPhil at Oxford University on a Rhodes Scholarship. Before joining the Law Faculty, he worked as an associate at the Supreme Court and at Legal Aid Queensland. Between 2005 and 2007, Ben was appointed as the full-time Commissioner of the Queensland Law Reform Commission where he had carriage of the Guardianship Review on behalf of the Commission. He also served as a part-time Commissioner between 2007 and 2010. The Best Paper by an Early Career Researcher was won by Emily Karanges and her collaborators for their paper “Twenty-five years of prescription opioid use in Australia: a whole-of-population analysis using pharmaceutical claims”. 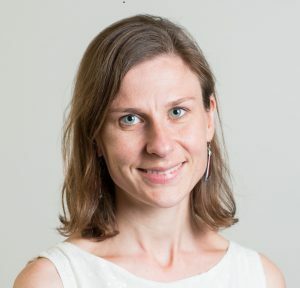 Dr Emily Karanges is a research fellow in the Medicines Policy Research Unit within the Centre for Big Data Research in Health. Her research focus concerns the pharmacoepidemiology of psychotropic medicine use. While her research extends to all age groups, Emily has a particular interest in the use of psychotropics in children, adolescents and young adults. She is also interested in the pharmacoepidemiology of opioid analgesics. Emily also has expertise in the field of psychopharmacology. In 2015 she received her PhD in behavioural neuroscience, psychopharmacology and psycho-pharmacoepidemiology at the University of Sydney. Her thesis was primarily concerned with the behavioural and neurobiological effects of antidepressant treatment during adolescence. 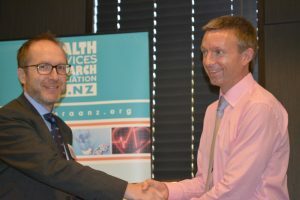 The Best New Zealand Paper was awarded to Robin Gauld and Simon Horsburgh and their paper “Does a host country capture knowledge of migrant doctors and how might it? A study of UK doctors in New Zealand”. Robin Gauld is Professor of Health Policy in the Department of Preventive and Social Medicine, and Director of the Centre for Health Systems—that spans the School of Business and the Dunedin School of Medicine. Current research interests include: comparative health policy, health system and quality improvement, clinical governance, primary care, population based health funding formulas, and health information technology. On 1 Dec 2016 he takes up a new role at the University of Otago as Pro-Vice-Chancellor Commerce and Dean of the School of Business. Dr Simon Horsburgh is a senior lecturer in Epidemiology in the Department of Preventive and Social Medicine at the University of Otago. Simon's primary research focus is pharmacoepidemiology, particularly in the area of using routinely-collected data to study medicines utilisation and access. He has also collaborated with Professor Gauld to examine health workforce issues such as clinical leadership and workforce migration. Dr Horsburgh is a founding member of the Pharmacoepidemiology Research Network, as well as an associate of the Centre for Health Systems. He serves as an associate editor for BMC Health Services Research. to show how their results are relevant to policy and/or practice. Details of all of the nominated papers can be viewed here. Once again the judges were impressed with the quality of all the nominated work which bodes well for future capacity in HSR. 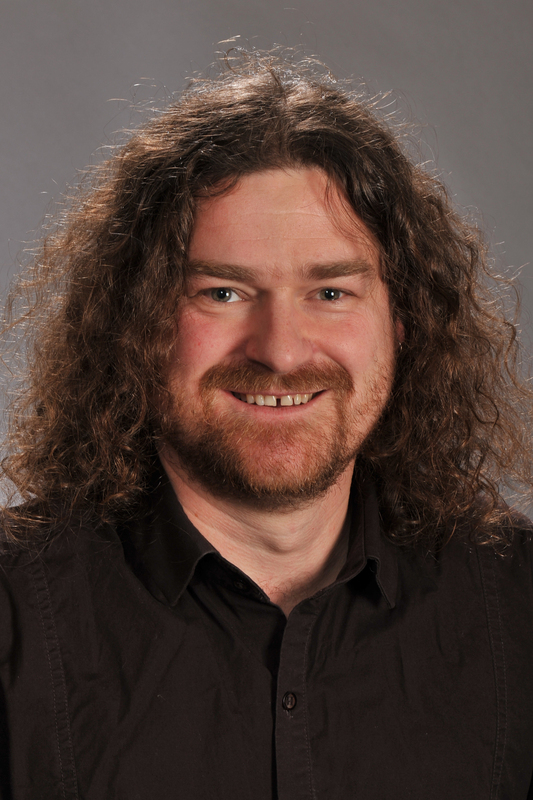 Michael Falster is a Biostatistician and Research Fellow at the Centre for Big Data Research in Health (CBDRH) at UNSW Australia where he is also completing his PhD . Michael has over 10 years’ experience working in public health, biostatistics and epidemiological research, and is currently project coordinator on the Assessing Preventable Hospitalisation InDicators (APHID) Study, an NHMRC funded partnership grant using linked data to explore contributors to geographic variation in ‘preventable’ hospitalisations. Michael’s work and interests are characterized by finding innovative statistical methods for quantifying and exploring variation in health and health care, such as: multilevel models for deconstructing geographic variation in health inequalities and outcomes; data visualizations exploring temporal patterns of health events; spatial methods for identifying and analyzing hospital patient catchments; and data algorithms for characterizing longitudinal patterns of healthcare use. Michael has experience in diverse fields such as health services research, injury, Aboriginal health, cancer epidemiology and perinatal research, and experience analyzing complex linked data sources including survey, hospital, Medicare, mortality, perinatal, cancer notification and emergency department data sets. Having a background in health, policy and statistics, Michael is interested in translating complex statistical methods and findings towards a policy audience. Elizabeth Whittaker from the National Drug and Alcohol Research Centre, UNSW for her work “Associations of Housing First Configuration and Crime and Social Connectedness Among Persons with Chronic Homelessness Histories”. Liz Whittaker is submitting her PhD this year, which has examined vulnerable homeless sub-groups and the impacts of Housing First configurations. Liz has worked on a number of homelessness and housing evaluations at the National Drug and Alcohol Research Centre at UNSW Australia, where she also co-ordinated the Northern Territory Ecstasy and Related Drugs Reporting System (EDRS). Liz has recently secured a Senior Policy Officer role with NSW Government Family and Community Services designing the evaluation of the Out of Home Care reforms. 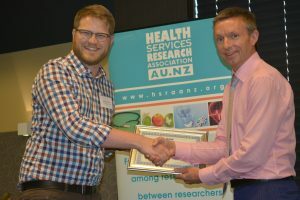 The projects nominated for the Best Impact Award were presented at the HSRAANZ Symposium. 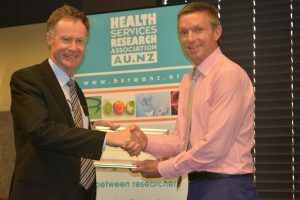 We will be reporting in more detail on the other winning research on the HSRAANZ Blog, over the next couple of weeks.